VANCOUVER, BRITISH COLUMBIA--(Marketwired - Dec. 15, 2016) - Tajiri Resources Corp. (TSX VENTURE:TAJ) is pleased to announce that it has commenced diamond drilling at the Gussie prospect and first assay results can be expected in January 2017. 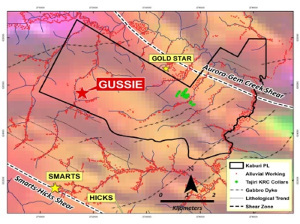 Located in the southwestern portion of the Kaburi Project the Gussie Prospect is located 4km north of the Smarts deposit at ASX-listed Troy Resources' operating Karouni gold mine (16.7Mt @ 3.1g/t Au; 1.65 Moz Au), in central Guyana. The Smarts deposit was discovered in 2011 by drilling a vein system exposed in artisanal pits similar in nature to those being targeted by Tajiri. The Gussie prospect comprises two artisanal pits, 75m wide with a total length of 500m, where, since 2012, artisanal miners have exploited bedrock gold bearing quartz veins. 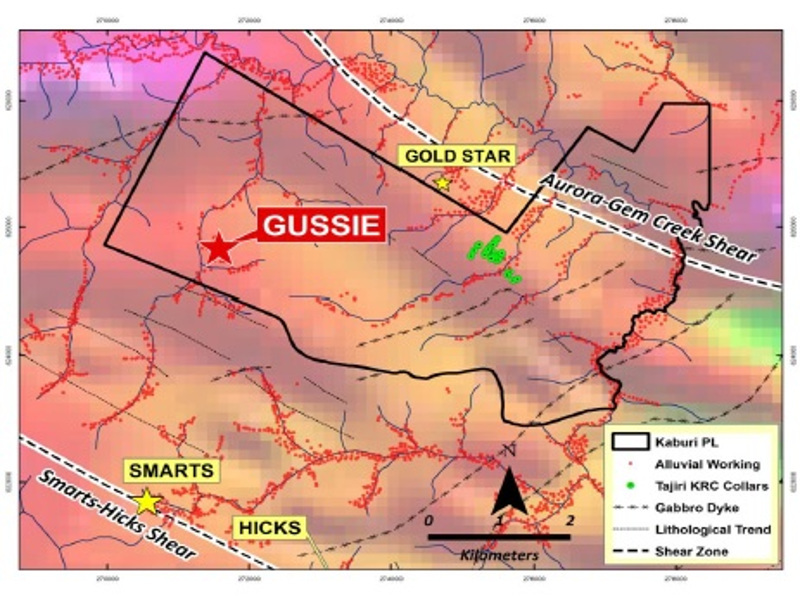 Within the district the Gussie prospect, after the Smarts and White Hole pits, is reputedly the third largest artisinal gold producer from in-situ gold mineralisation, yet Gussie remains undrilled. The Gussie gold vein zone comprises massive and sheeted quartz veins hosted by deformed subvertical northwest-trending mafic volcanics and sediments. Saprolitic volcanics and sediments are exposed below a cover of unconsolidated sand, which is up to 5m thick. Bedding and structural data indicate that mineralisation occurs on the eastern limb of an anticline plunging shallowly northwestward, similar to the structural setting of mineralisation in the Karouni Mine. The initial drill program comprising 500 metres of diamond core will explore the width and strike length of the Gussie vein systems exposed in the pits. The regional magnetic geophysical imagery (see Figure 1) shows Gussie lies in close proximity to a northwest striking contact between a magnetic high (mafic volcanics?) and a magnetic low (sediments / felsic volcanics). Given that the stratigraphy at Gussie strikes northwest-southeast and the long axis of the artisinal pits that have followed mineralisation is also northwest-southeast, there is a strong suggestion that mineralisation may be related to a regional contact between mafic volcanics and sediments. If this is the case then the Kaburi project contains a potential 5.5 kilometers strike of the contact structure which hosts Gussie which may prove to be mineralised. This News Release includes certain "forward-looking statements". Dr Anthony Norman has reviewed and approved the technical content of this press release. A structural, metamorphic and economic geologist with expertise in project identification, evaluation and exploration. Dr Norman holds a Bachelor of Science (Honours) degree and a Master's degree from the University of Sydney and a PhD from Macquarie University. He is a member of the Australian Institute of Mining and Metallurgy and a competent person for the reporting of gold resources making him a 'QP' or Qualified Person under the National Instrument 43-101 requirement etc.